PORTLAND, ME — February 25, 2015 – Page One Web Solutions, a Maine-based web marketing and search engine optimization firm, is proud to announce the launch of a new redesigned website for East Coast Lightning Equipment Incorporated (ECLE). 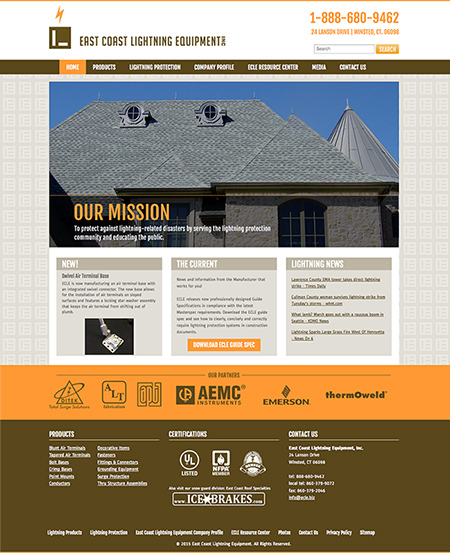 The new website, www.ecle.biz, features enhanced functionality as well as a cleaner, easier layout to navigate. Additionally, the website uses responsive web design, which allows for easy viewing on any device. East Coast Lightning Equipment Inc.’s new website design was featured on DesignandBuildwithMetal.com’s homepage on February 25, 2015. DesignandBuildwithMetal.com is a popular news resource for general contractors, builders and product manufacturers and suppliers in the metal construction industry. Page One Web Solutions takes pride in the high-quality sites they produce and is thrilled with the positive attention ECLE is already receiving for their new site.